I have been somewhat of a Francophile for as long as I can remember. Breton stripes and good butter are beloved in my little world, I have been known to throw rigorously French-themed dinner parties and if I thought I could get away with it, there’s a good chance I would take up wearing a beret. My excitement was therefore understandable when I discovered that there happens to be a highly regarded little bistro serving up country-style French cuisine not too far from Dublin, in Naas. Determined to amuse my bouche, a trip to Naas seemed a small price to pay so Jules and I decided to sample Vie de Chateaux, which has been named RAI Best Restaurant in Kildare on numerous occasions in its nine years of business thus far. Owned by Frank Amand, a native of Normandy who worked in Patrick Guilbald and managed La Mere Zou for seven years before opening Vie de Chateaux, we were convinced we would be in safe hands. Having gotten a little lost after pulling up to the picturesque Naas harbour canal on a fantastically sunny afternoon, we managed to find our way to a canopied little premises which revealed itself to be Vie de Chateaux. Quaint and cosy on the outside terrace, we were taken aback by the sleek, plush grey and slate-toned decor inside. Chic and stylish with little French nods like an oversized Roman numeral dotted clock, this space had clearly been recently refurbished with great thought and investment. If this attention to detail and eagerness to impress would carry through to the food we were in for a treat indeed. Opting to take our leisurely lunch on the terrace to soak up the rare rays of sun with a view of the canal, we were pointed to a specials board alongside an extensive lunch menu with the option three courses from their bistro menu for €25 or an array of more casual lunch dishes, a la carte. I was immediately pleased to see that the menu read like an authentic offering of classics, simple and grounded in French gastronomic tradition. My desire to be mentally transported to the canals of Annecy drew me towards Le Lapin(€8), a quintessentially French terrine of rabbit with toasted sourdough. A thickly cut, generous tranche of green peppercorn speckled terrine arrived, with canals of jellied flavour swirled through. Rich, rustic and deeply gamey, this was a perfect showcase of what the French do so well, utilising nose to tail ingredients to create dishes which are 100% flavour-orientated. My Irish tastebuds tend to prefer something slightly sweet to cut through fatty indulgence, but here piccalilli (seemingly one of the rare British creations to pass muster with les francaises) was a sharp, pickled counterpoint providing the necessary acidic contrast. Jules shares my enthusiasm for le fromage and can always be counted on to split a cheeseboard, this time however Le Brie de Meaux (€8) was on offer as a starter and we were intrigued. 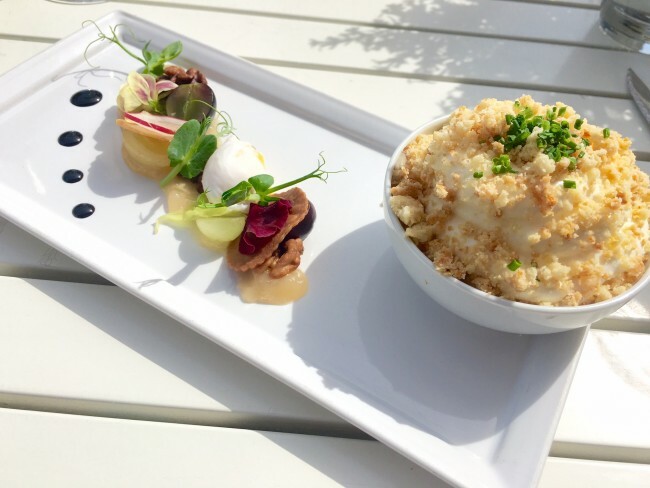 Described as ‘brie chantilly’, a bowlful of whipped, cloud-like créme was presented topped with a contrasting crumble sitting alongside an artistic display of pear puree, candied walnut, grape and curiously, a poached quail’s egg, which we agreed wasn’t really necessary. This whipped wonder managed to pack in the depth of flavour and pungency you expect from quality Brie de Meaux with the textural lightness of a feather on the tongue. Finally, a cheese you can comfortably eat by the bowlful with a spoon! While the pear puree tasted more like green apple in sharpness, it was the perfect foil for the dreamy cheese. Food envy is a terrible thing and this dish had me a little green eyed. Starters had set a positive precedent, and lapping up the relaxed ambience I had almost forgotten what main I had opted for when it arrived. 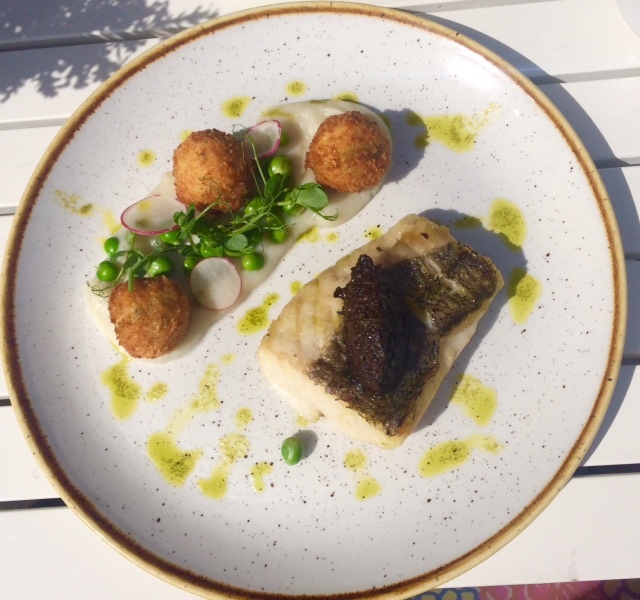 Le Colin (€14), or hake to those of us less linguistically gifted, was a stunning plate of simple ingredients married together beautifully – I wouldn’t insult the perfectly cooked fish by taking a knife to it. What we guessed was a Jerusalem artichoke puree, one of my favourites, was delicious topped with the sweetest of petit pois and crisp tomato scented quinoa bonbons. I’m not quinoa’s biggest fan, but I would eat it in this incarnation all day. A light but luxurious dish, chef Sylvain Costrowa flexes his culinary skills, picked up during his time in 3 stars such as Le Bristol Pallace in Paris, effortlessly with such elegance. Across the table, Jules was faced with a seriously hearty lunch portion of Rack of Lamb(€29), having gone off piste to order one of the specials offered that day which also appear on the dinner menu. 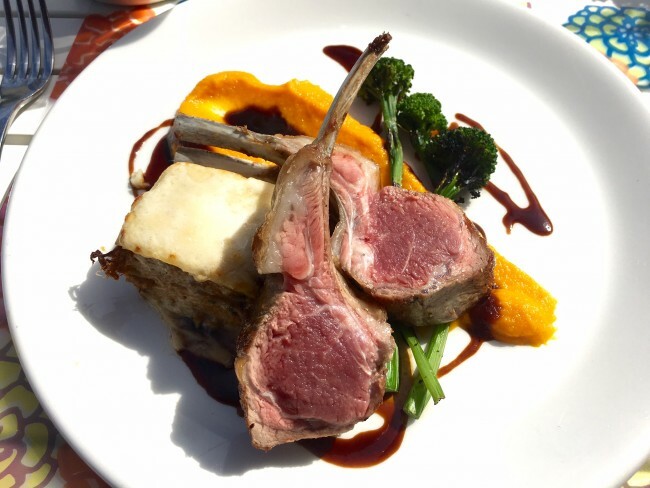 Two quiveringly rare (I love that the French take the word ‘rare’ exceptionally seriously) cutlets sat atop a perfectly seasoned, sweet and silky carrot puree and a little cross-cultural surprise, lamb shoulder lasagne. Perhaps not for the purists, this lasagne was the unexpected star of the show, overtly meaty, meltingly more-ish and decidedly French crowned with oozing gruyére. Drizzled with a classic port reduction, like my own main this was seriously sophisticated cooking for lunchtime service. Contemplating never returning to work momentarily, it was such a treat to luxuriate in the sun with a chilled glass of wine(€6.80 each), truly embracing the gift that is a decadent déjeuner. 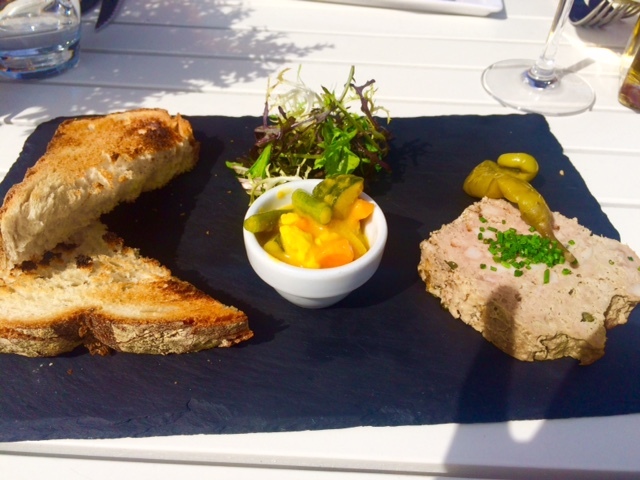 The French love a lingering lunch and Vie de Chateaux’s terrace is the perfect spot for this. Although groaningly full from the preceeding courses, we felt obliged to honour this French ritual with dessert. Narrowly passing up the tempting classic creme brulee in favour of something lighter, Les Fraises (€6)would hopefully ensure neither of us fell victim to a food coma on the way back to the office. Described as a strawberry soup, a dish that appeared colourful but slightly uninspiring turned out to be extremely punchy indeed. More like broth than soup, a thin but intense rouge river was the very essence of summer infused with deeply rich strawberry tones. 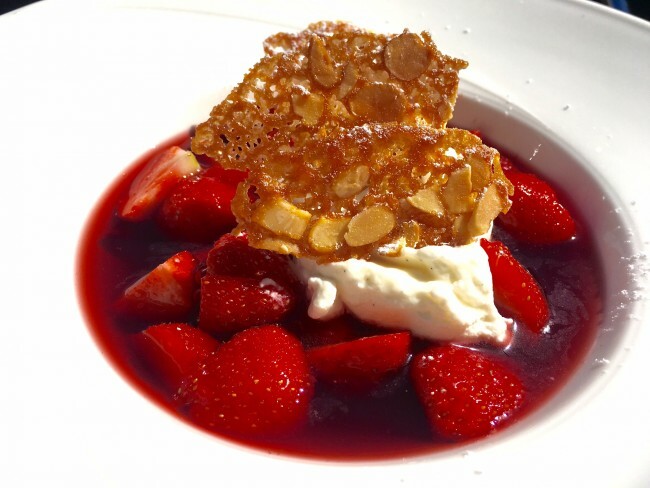 Topped with vanilla-spiked fromage blanc and a delicate almond tuille, this is what a Wimbledon bowl of strawberries and cream would aspire to be. Leaving our French retreat and remembering we were in fact in Naas and had to return to the office was a bit of a pin prick to the bubble we had spent lunchtime in. I would happily have sat longer, letting myself be lured into a false sense of French surroundings, likely sampling the wine and cheese offering more extensively but alas, it was Wednesday and reality beckoned. Our bill, excluding service, came to €78.40 for two courses each, a shared dessert and two glasses of wine. Vie de Chateaux and the traditional, classic country French fayre it delivers so well will please anyone looking for an authentic taste of France without boarding a plane or suffering a ferry in the name of fromage. Our most enjoyable lunch was a rich and indulgent afternoon treat after we had both begun the week with vows to avoid all temptations and be good. While Vie de Chateaux probably wouldn’t be the obvious choice of the health conscious, I’ll be back for my own bowl of brie, safe in the knowledge that French women don’t get fat.